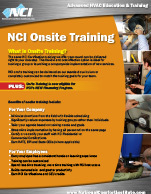 More HVAC contractors are discovering the value of bringing NCI training onsite to their facilities. The same NCI Certification training that we offer year-round can be delivered right to your doorstep. This flexible and cost effective option is ideal for training a group or launching a company-wide implementation of new services. Onsite training allows for virtually no travel expenses and your employees spend more time training with NCI instructors. Plus, you'll save on productivity costs as field work and large projects won't be put on hold. NCI training can be delivered as our standard curriculum or completely customized to match the training goals for your team. 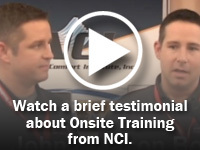 Customize your NCI onsite experience by combining classroom and hands-on field training. NCI instructors can walk your technicians through a live diagnostic visit at a customer's home or complete hands-on exercises at your facility. Each onsite is unique to the company's needs and provides your staff with a training experience they won't soon forget. Call NCI at 800-633-7058 for a free initial consultation today! Our industry-changing training programs bring measured performance, effective efficiency, and safety to the frontline of your business. NCI is focused on helping contractors develop a Performance-Based culture that will enable them to become more successful in their market. Our hands-on, interactive training sessions provide the best practices and tools necessary to achieve the highest level of quality and performance. The process begins with a one-on-one initial consultation to establish training goals and outcome. We create a customized proposal to fit your specific training needs and submit it to you for approval. Upon approval, the agreement is signed and together we reserve your dates. Generally the evening before the on-site, the NCI instructor will meet with management to review company goals and agenda. The next morning we begin training according to the agreed-upon agenda. This might include classroom time, hands-on field training, or even departmentalized training. Training equipment will be provided by NCI. We can also use your tools and instruments.